The picture that you see above demonstrates an attic ventilation system and the effects of heat and moisture in/outside of your home. 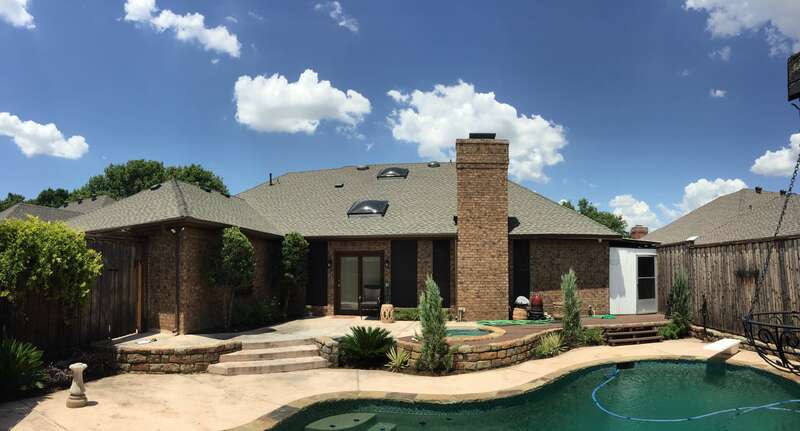 We know that not all homes have a simple roof structure like the one pictured above, therefore a thorough analysis is critical to handling more complex roofing systems. 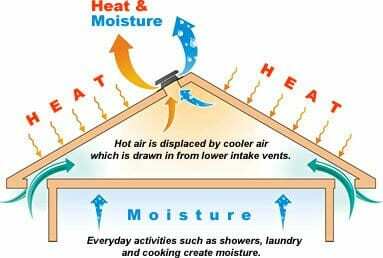 As GAF/ELK Authorized Installers, we can engineer an attic ventilation system that is specific to your home. Failure to verify one or more of the above criteria during an attic ventilation system installation is considered improper. 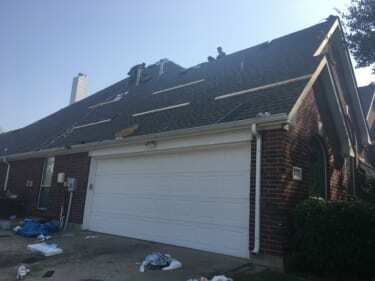 Furthermore, considering the shape, pitch, direction, and attic space of your roof are extremely important in choosing the correct products to install. The graph above demonstrates the rise in U.S. energy costs over the next 25 years. In 2009, our energy usage was in the neighborhood of $60 billion. But by the year 2035, it is estimated that the number will jump up between $180 and $210 billion. The U.S Department of Energy estimates that the average person will increase their energy cost by at least 5% every year and up to 25% every 5 years. The contributing factors to the rise of energy usage can be attributed to things such as growing families, electronic devices and the purchasing larger homes. That said, the right attic ventilation system will dramatically reduce your energy usage. It’s a scientific method proven to keep your home cool during the hot summer months, thus, lowering the usage of your A/C unit and furnace. Consider your car engine as an analogy. The intake and muffler of the vehicle keep the engine cool by allowing the proper amount of air to circulate. The cooler the engine, the better gas mileage you’ll receive. The same concept applies to your roof. The cooler your attic, the less radiated heat will transfer to the rooms below. This reduces the need to excessively run your A/C unit. We’ve developed a cost comparison formula to show you that you are not purchasing an attic ventilation system, but that you are investing in one. Savings on your electricity bill with an after-market attic ventilation system: 20% to 30%, which means you could save up to $120 a month on your energy bill! Even at its lowest cost comparison of 20%, you’ll save $40 a month on your energy bill. Which means that in 12 months, you can save $480. In 2 years, you can save as much as $960 which nearly pays for the entire installation. And finally, in 5 years you can save $2,400 on your energy bill. That’s a 250% return on your investment. This is not even factoring in the 5% or 25% rise in energy costs. Considering these numbers, you can’t afford not to install an after-market ventilation system upgrade. We’re the experts at attic ventilation system upgrades. Give us a call at 1-888-618-3271 and we’ll apply our proven techniques to reduce the cost of your energy bill. As a bonus, you will prolong the life-span of your roof and save money by avoiding unnecessary repairs. Additionally, to learn more about attic ventilation systems and beneficial products, click here.